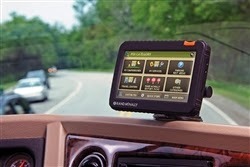 Product Overview: The Rand McNally 7" RV GPS has been designed specifically for RV'ers and their larger motorhomes and campers. The RV easy routing begins with award winning navigation from Rand McNally which includes legal (propane, RV allowed) routes, along with parkway and boulevard weight and height restrictions. This can be tailored for the specific type of RV you are using. The TripMaker RVND 7720 is packed with all of the information you need to have an enjoyable and safe trip in your RV, including campgrounds, parks, RV service locations, travel centers and suggested road trips! The display is a huge 7.0" TFT High Definition Widescreen. Product Review: Initially, I had a love hate relationship with this GPS. I generally plug in a new device and try to use it before reading the instructions. It generally works with many of my past GPS's, but with this unit and all of it's features, I should have read the manual first. I got myself into a number of bad situations with routing because I had not carefully setup the RV options. When I first received the GPS I had put the wrong height in and found myself confronted with a 10' railroad bridge in Jamestown, Ny, with a 12' 6" tall RV. After avoiding that disaster and updating the height setting, I still seem to be directed on roads that made no sense. I later figured out that due to the high weight rating of the RV, it took me on roads that may have been legal, but where not meant for my RV. I lowered this rating and the routes became much more accurate and many times matched google maps directions. It was about that time that I decided I better read the whole manual to ensure I wasn't missing some other feature or setting. We have now put over 15,000 miles on the Tripmaker since my initial issues, mostly self induced, and what I really enjoy are all of the RV related points of interest this GPS has to offer. From the huge number of campgrounds to rest areas and travel plazas, having this information at your finger tips is a great help. We used this unit on a 4 day trip with no idea how far we would get each day, but no problem with the Tripmaker, as we got close to ending our day we could quickly hit the campground search along our route, found a good fit and stopped for the night. Not a huge feat since most GPS systems have campgrounds preloaded, but out of all of the units we have used including Tom Tom, Garmin & Magellan this unit seems to have every campground in existence. Campgrounds are broken into types including state, commercial and KOA's for even faster location. Multi-stop trips are also a breeze with a dedicated section for these types of adventures. Usually I will bring the unit in the house and add all of our destinations from the comfort of my recliner a few days prior to taking off. The size of the screen and the big navigation buttons are nice when your changing screens and the road is not perfectly smooth. This is by far the most sturdy window mount we have ever had with a GPS, even on hot days it never lost grip and is always super sturdy. Since this is for RV'ers they probably should have included an adhesive disc for Class A motorhome owners that cannot mount a GPS to the windshield.